The Israeli air strike on Gaza killed a key Salafist leader and a fellow activist. The two were members of the Mujahedeen Shura Council. 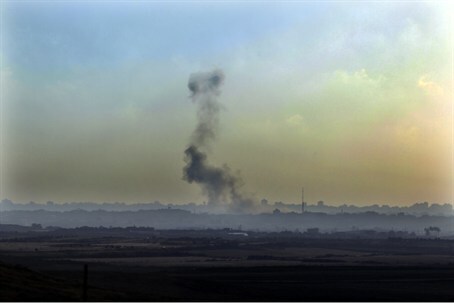 The Israeli air strike on Gaza Saturday night killed a key Salafist leader and another terrorist, the IDF said in a statement on Sunday morning. The two were identified as Jordanian national Sheikh Hisham al-Saedini, 43, also known as Abu Al-Waleed Al-Maqdissi, of the Mujahןdeen Shura Council, and Fayek Abu Jazar, 42. Hisham al-Saedini was one of the founders of the Mujahideen Shura Council, said the IDF, noting that this organization is affiliated with Global Jihad and was involved in extensive terrorist activity against Israeli civilians and IDF soldiers over the years. The organization promotes a radical concept based on the principles of jihad and Salafism. The Shura Council organization, according to the IDF statement, is responsible for a series of terror attacks inside Israel, including an attack on January 27, 2009, in which a powerful bomb was detonated at an army patrol, killing one soldier. Al-Saedini had been responsible for terrorist activity in Gaza. He had been previously been interrogated and imprisoned for a lengthy time period by Hamas, but was released in August of 2012, despite Hamas being aware of his involvement in terrorism. The IDF noted that since his release from Hamas’ prison, Al-Saedini had been planning a massive terror attack in cooperation with terrorists from Gaza and with Salafis based in the Sinai Peninsula. The Mujahideen Shura Council had issued a statement earlier, saying it was behind a Grad missile attack on Netivot Friday night. The rocket exploded in the yard of a residential building, causing one person to suffer from shock.